In the interest of a fair review, I made myself flip through the rest anyway. 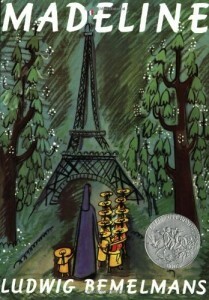 What I picked up is that the character of Madeline is everything that Feminazis say they want in a “strong female character”, as we are told from the beginning that she’s not afraid of anything, including mice and a tiger in the zoo. Are we supposed to impressed? Mice aren’t scary and the tiger is clearly in a cage. Does anyone think this precious little snowflake would have lasted five seconds against that tiger in a real fight? Hell no! She wouldn’t have. Not even five seconds and that’s the truth this book takes such pains to conceal from you. SJWs want us to believe that women are just as strong as any man but then they stage this kind of ridiculous pantomime where we’re supposed to be impressed that they aren’t frightened of zoo animals. But it is the SJWs who are sexist against women by suggesting women should be afraid of caged animals and tiny rodents. Anyway, it seems like Madeline isn’t such a “strong female character” when her appendix gets inflamed! She cries like a little girl, and guess what? That’s right, a MAN comes to her rescue. We’ve left short stories and are now in the land of the novelettes. And the first story here, “The Day the World Turned Upside Down” by Thomas Olde Heuvelt, is also the first story on the ballot not from the Sad or Rabid Puppy slate. As you probably noticed, I’ve been struggling with the puppy-related stories, so I was glad to see something different. And at first I thought my optimism would be rewarded — the writing is clear, with a light magic realist touch, and the situation — man dumped by his girlfriend — is interesting and relatable, at least in the beginning. The only freely-available Hugo novella I have been able to find is Arlan Andrews’ Flow. I just finished reading it, and am frankly underwhelmed. So. The Hugos. Up until this year I was not aware that this was a vote-by-random-people-with-memberships award. As I’ve mentioned, I’m not really an awards person at all. I tend to disagree with all the award-winning choices and therefore don’t put much stock in them. It’s very political … which this year’s Hugo Debacle (I think it deserves capitalization after all of the drama generated) aptly demonstrates. Many other bloggers and authors have explained it much better than I can, but I was curious to read some of the short stories and novellas that were up for awards. I’d read a book by Edward Lerner a long time ago: it was Fools’ Experiments. I remember that I didn’t really like it because it seemed silly, but I had hoped that Lerner would grow as an author and clean up the writing a bit. I think things got better. They’re not fantastic or mind-blowing or OMGREADTHISNOW, but I rather enjoyed Championship B’Tok. A problem with the #hugoawards is that it's the same group of people reading the same authors, every year. WorldCon needs new blood. This would be entertaining if it weren’t so sad. After all, as I keep saying, we’re not asking anyone to vote without reading. That would be a heck of a lot easier. And why would anyone pay forty bucks to vote if they didn’t actually care about the topic? Remember, your own side is buying votes for other people. If suggesting to other geeks that a Worldcon supporting membership is worth them buying themselves is bad, how is it okay for the anti-Puppy crowd to actually buy votes? The Hugo is a strange award. One Hugo matters a great deal—the Best Novel. It sells copies of books, and defines for the casual SFF fan the “best” of the field. The Novella, Novelette, and Short Story also carry significant weight in the SFF field at large, helping to define rising stars and major works. Some of the other categories feel more like insider awards: Editor, Semiprozine. Others feel like fun ways to nod at the SFF fandom (Fanzine). All of them work slightly differently, and there’s a huge drop off between categories. That’s our point of scrutiny today, so let’s get to some charts. Honest question. Will it be used on book covers? “Winner of the top prize from the morally bankrupt and politically corrupt organization of strongarming fools and their sycophants that I spent two years excoriating in every venue I could think of!”? Looking over our traffic stats for last month, I want to give a shout-out to M Harold Page, who managed to heroically crack the Top 10 without once mentioning the Hugo Awards or Rabid Puppies. Well done, Mr. Page! He was the only one to accomplish that extraordinary feat, however. Every other article in the Top 10 for April (and more than a few in the Top 25) directly addressed the ongoing Hugo Awards controversy, which began on April 4th when Worldcon announced the nominees for the 2015 Hugo Awards — a group which usually represents the finest science fiction and fantasy of the year, but this year was largely dictated by a single individual, Vox Day (Theo Beale), and his Rabid Puppy supporters, who crammed the slate with 11 nominees from Theo’s tiny publishing house, Castalia House, and nominated Vox Day personally for two Hugo Awards. Not coincidentally, Black Gate received the first Hugo nomination in our history, and one of our bloggers, Matthew David Surridge, was nominated for Best Fan Writer, both as a direct result of being included on the Rabid Puppy slate. We declined those nominations, for reasons that I think should be fairly obvious. I love visiting the sites of authors I respect, especially the ones who also do a great job of keeping their blogs up. There’s been no shortage of big names making public statements lately: Mary Robinette Kowal, George R.R. Martin, John Scalzi, and plenty of others have had lots to say about the Sad Puppies’ slate of Hugo-nominated works. Right now, GRRM has had the most activity on his site I’ve seen in a long time. It’s clear that he is still as invested in worldcon as he ever was. In other words, his mind-blowing success hasn’t changed his passion for the form. Given his tenure, his opinion is not to be taken lightly. Last week, he made something like three posts within 24 hours. I can’t look away. Ugh. Should stop reading #hugoawards roundups, because Beale has become an evil mastermind in my dreams. Yes, we understand: you need to lay into Codex & Q with both barrels, but are stymied by the limitations of public decency. Here’s an insult generator for all your invective needs: have fun! And you’re welcome.